Cover Description: Six futuristic policemen on "skycycles" race across the night sky. In the background a large tower advertised a "citizen alert" for Booster. Brief Synopsis: Trapped in the future, Booster deals with a personal loss and his failing health. Booster makes the odd comparison between his theft of a time machine with "detonating a nuclear bomb in a church!" Rip wonders about the apparent lack of technological progression in the 25th century. Viewscreens display news on the sidewalk in much the same manner as vending machines currently display newspaper headlines. Christmas decorations line the streets. All-in-all, it's a relatively contemporary portrayal of the distant future. The news broadcast that Jack and Rip watch is sponsored by Pepco Cola, a rival of Soder Cola as far back as the 20th century. Booster will one day endorse Soder Cola. Booster and Trixie are confronted by 25th century Gotham policemen who wear armored suits and fly anti-gravity "skycycles." Their visored appearance is not too far removed from that of 2000 AD's post-apocalyptical 21st-century lawman Judge Dredd. The lawmen destroy the Time Sphere. This is very clearly not the same Time Sphere that Booster originally used to travel from the future to 1985. Lamenting the destruction of the Time Sphere, Jack comments that he is "marooned in the 25th century! Hmmm. Great movie title." This is an allusion to the early 80's movie and television series Buck Rogers in the 25th Century, a science fiction drama about a 20th-century astronaut stranded in a post-apocalyptic future. FIRST APPEARANCE: First appearance of officers Bill and Farrell of the Gotham City Police Department of the 25th century. 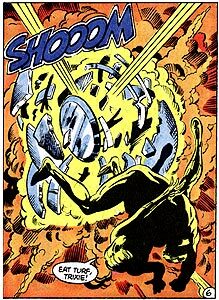 Jack and Rip learn that a "nuclear conflict" has ruined historical records of the late 20th century, as Booster first revealed in Booster Gold, Vol. 1, #9. Rip suggests that this conflict is the result of the apparent lack of technological growth in the 25th century. Booster and Trixie are attacked by a mutant-hunting Animal, whose costume and lack of hairstyle bear more than a passing resemblance to the suit commonly worn by Lex Luthor in the Challenge of the Super-Friends television show. Despite Booster's opposition, Trixie saves the life of the Animal from an accidental drowning. Booster, pragmatic at the best of times, seems to be unconcerned about saving the life of the creature that is trying to defeat them. Rather than flee, Booster turns himself in to the Gotham Police when they capture Trixie and threaten her life. There are many instances of Booster bluffing about physical harm, up to an including death, to subdue a villain. This is a tactic used by the 25th-century police here, indicating that Booster, a bit uncouth by the standards of such altruistic heroes as Superman, was influenced by the law enforcement of his time. FIRST APPEARANCE: First appearance of Broderick, a federal officer. Broderick reveals that in the 25th century, crimes involving time-travel are punishable by execution. To have an established policy, there must be multiple instances of time travel. Perhaps life would be a little easier for the policemen of the future if the city museums weren't full of functional time-travel devices for the night watchmen to steal. Using a 25th-century "beat-up old entertainment center," Jack has repaired Skeets to 63% of capacity in matter of hours. Skeets is shown to have one-quarter of his frame removed instead of the entire top half seen removed in Jack's S.T.A.R. Labs office. 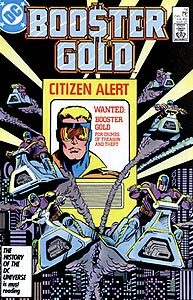 Boosterrific Review: While it would seem that returning Booster Gold to the future would make for an exciting read, this comic book fails to deliver on that potential. Booster, who is supposedly dying, does little in this issue other than wallow in self-pity. His supporting cast works on the problems of his failing powers, repairing Skeets, and foiling the police force chasing them. It's great that DC's long-unused Rip Hunter has so much to do in this story, but it's also a bit a shame that he's more relevant than the title character. This book is hardly terrible, but neither does it quite live up to its recent predecessors. I actually appreciated the comic more for introducing Broderick, a character who has a better issue a little later on. Easily the worst issue so far in the first run.